“Well, yes, I don’t have live support on my site”, – you’d say, – “but what’s the point, what is there to fork out for?” And you’d be right asking that question. If you don’t know your destination, you’ll never arrive at it. It is surprising, how many things in life occur in this pattern. You may have the best tools and means at your disposal for achieving something, but you are not getting anywhere, simply because you don’t have a clearly outlined idea of where you would like to end up at. If this question is bubbling up in your mind, you are on the right track paving your way to success and maximizing the profits from the chat tool. Live chat technology has evolved in a way which allows you to enable the software to serve different aspects of your business. Customer service is of course its primary field of application, empowering support agents to do miracles and convert the displeased into the adoring fans and to turn first-time buyers into repeat customers. But apart from fulfilling this function, did you know that live chat can give you great insights into your marketing planning? So it can. Real-time traffic monitoring combined with analytics supply you with loads of information about your customers, such as where they come from and what their behavior on your website is, so that you can work out better ways to approach them and establish a business relationship. This same information allows you to identify the leaks in your current business model and your website performance to help you battle some of the common online commerce problems, from abandoned shopping carts to design mishaps and security holes, etc. It’s no doubt that phone and email are very important to any business. Before live chat had made it onto the scene, they were the only options and truly indispensable. But with the appearance of chat, having an online sales rep is similar to having a sales person in a brick store. Would you open a brick-and-mortar store and have no sales people working there, just phone booths and computers to call the agent? It sounds really scary, doesn’t it? Well, having a web store without a sales person available right there and then furnishes for pretty much the same customer experience. The place feels deserted and lonely, you can’t have any confidence in it. Even if you make a purchase at your own risk, you are left wondering whether you are ever going to receive the order or have any post-purchase help should you need it. And this is true not only for online stores, but for any other type of business as well. If you are into consulting for example, it is likewise better to start interaction with the customer right from the site, rather than sending them away to make a phone call or send an email and making them wait, as this may end for you in losing business with them at all. There are many people indeed who are used to calling a company if they have a question or a problem. And they would call even if it’s much faster and easier for them to start a chat, as in case when they are on the website already, or shoot an email, when their issue is not time sensitive. It’s a matter of habit and we all know how hard it is to break our habits. Of course, that does not take away from the convenience of the phone in certain situations when it is better to discuss things in voice rather than in text. But in most cases, it’d still be about our being used to calling. If you haven’t used live chat and one day decide to start it, you’ll be surprised to learn how many people hate having to call someone. For various reasons: they may dislike the wait, the transfers, simply hate the phone, or the need to allocate the time and a quiet space to make a phone call. Obviously, they fall out of the first category of phone admirers and you will never hear from them unless you offer the contact options convenient to them. By limiting the channels through which your prospects can reach you, you are also limiting your business opportunities. This has still bigger impact for businesses operating world-wide, which is almost any other business with a website. Not many of your overseas customers will be willing to spend on international calls, and that goes without considering the language barriers and the quality of the phone connection on long distance calls. Those can sometimes be really annoying, can’t they? The fact is, you don’t necessarily have to use them. Your live chat can be clean and neat as a pin. Like with any other tool, here too, proper implementation is necessary. In the wrong hands, even nectar can become poison. Excessive use of chat invitations can seriously hurt your company image and drive users away from your site instead of engaging them. Basically your options are two. You can make do without proactive chat, simply allowing the users to make the first move and start a chat when they need and want it. Or you can employ proper strategies and offer invitations only to target customers, those who are likely to appreciate your effort and make use of it. The latter approach will even allow you to grow your client base, so proactive chat is not totally evil, counter to what you might have thought of it. The brilliance of live chat technology is its ease of installation and use. It’s no Photoshop to master. This is the one area where you won’t feel yourself inferior even if you don’t have a clue about html. Adding live support to your website takes nothing more than to copy and paste a code snippet into your webpage source. If you have been deeming lack of technical knowledge as a hurdle to your getting a live chat for your website, you can safely count it out. If you are interested to read more on how installation works, you may refer to this article: Adding Live Support for Website. How It Works. This reason is of course very solid. If one can’t afford something, one just can’t, there is nothing to do about it. However, if you as a business have a tiny budget which you use to grow your enterprise, investing it into live chat can help you get things moving. One of the major mistakes of many online business is that we spend thousands of dollars on attracting customers to our websites and then just let those people go, disregarded and unengaged, without ever reaching out to them past our ads. It’s like heating the room with the windows open, all the advertising money going down the drain. If you can concentrate on engaging more with the users that you have already driven to your website, this can dramatically improve your conversion rates, without spending another dollar on generating more ads. Live chat can be helpful here in several ways. Apart from passively making yourself available to clients if they have any questions about your product or service, you can build a rewarding proactive chat strategy which will bring more leads to you. Having the opportunity to closely watch their behavior on your site, you can also restructure your website content to make it more appealing to users and more functional. For example, simpler sign up forms, check out process – anything really where you notice users appear to be stuck or reluctant to continue to actively engage with your website – will help you convert more customers. Live chat subscriptions for small business start from $15/month, so if you are on a tight budget, it may be your best investment, as it is cheaper than placing more ads, and allows you to target both existing customers and new prospects. The above are the most common excuses for not having live chat communicated by our customers. 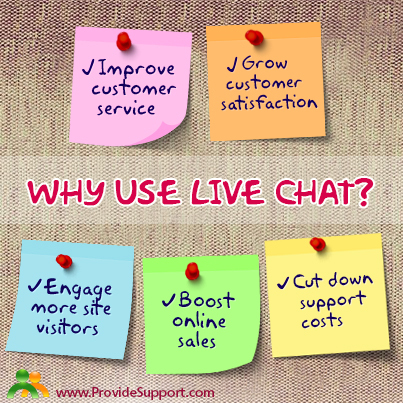 How about you, do you agree with the importance of live chat for customer interactions? Are there any other reasons you are leaving it of consideration for your business? We’d love to hear your thoughts on this. This entry was posted in Articles and tagged live support chat for website, the benefits of live chat for website, the reasons to use live chat. Bookmark the permalink.